Origin 1:1 “In the beginning was the amoeba. In the beginning was a big bang. Evolution has taken on so many forms and none of them have disproved the creation account of the Bible and these theories of evolution even go a long way in proving the account of Genesis 1 and 2 in the Bible to be true. In science it is proper, when trying to prove or disprove something that is thought to be a fact, to introduce a theory and to run this theory head to head against the alleged fact. The alleged fact will either be strengthened or will be shown to be a fallacy. Likewise the theory will be shown to be utter fallacy if it does not hold up under a bright light when compared to the alleged fact. Thus has been the case with creation science and the theory of evolution. Evolution as a theory has changed so many times in form in a failed attempt to disprove and discredit the Bible account that the theory of evolution has proven by itself that only the theory of evolution itself is indeed evolving. First of all to buy into evolution, one must believe that something exists with no cause for its existence. I did not use the word believe in that sentence in passing, but it was a deliberate use of the word. Belief finds its origin in religion and is closely associated with faith. Evolution is a man made religion with its own belief system and its own moral code. I would argue that it is actually an amoral code. Evolution is indeed a religion of its own for people who by and large are said to have sworn off religion. But the evolutionist must believe in the ameba or in gasses that somehow existed and also without cause then ignited into a big bang, again without cause, for the ignition of the gasses. Let me tell you that in my humble opinion, the Genesis 1 and 2 account require much less faith and answer the questions of cause and effect much better than “In the beginning was the ameba, or gasses and a flint, or a big bang. The Genesis account tells the Who of creation. “In the beginning God” tells us the person behind creation. This gives us cause and effect that evolution never answers. Friend you are going to believe and have faith in something or someone. You are going to be religious either with true religion or with a religion of Darwin’s concoction along with your own moral code. 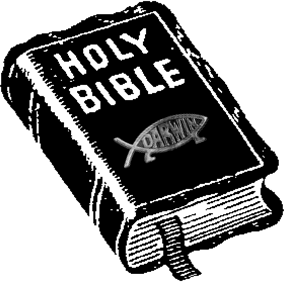 In closing I beg of you to choose the true religion of the Holy Scriptures that tells us who created the heavens and the earth and why he created them. It further tells of One who gave His life that we might have everlasting life with Him in eternity. Choose a relationship with God through Jesus Christ and in His finished work on the cross.